If you're comfortable with the thought of dropping another $200 on a superior controller for games like Rock Band 2 and Guitar Hero World Tour, check out our full review of Logitech's premium wireless guitar controller for the PS2 and PS3. In terms of the design, it's quite similar to the Guitar Hero World Tour (and Guitar Hero Metallica) guitars. It's a little bigger and a little heavier, but more importantly, a lot less plastic - with a guitar finish, wooden neck and a rosewood fingerboard. The added weight will lead to you getting tired quicker, but that's ultimately a healthy thing, right? Functionally, it's the same as a Guitar Hero World Tour guitar. The key difference is that the trademark clicking sound of the strum bar has been dampened significantly. There's still a clear tactile button press occurring, just without that distinctive click. I've always preferred this feel to the softer Rock Band guitars, and in my experience playing music games with other people, almost everyone else does, so it makes sense that Logitech preserved it. The difference being that with the annoying clicking sound gone, one of the last nagging reminders that you're not really a rock star is gone along with it. 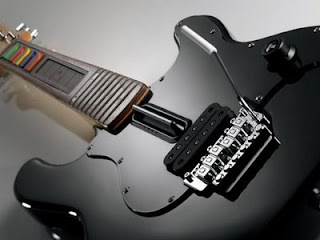 To nitpick, the edge of the neck below the fret buttons is a little on the sharp side, which can be uncomfortable if you tend to rest the bottom of your little finger there. That said, the high E string on a real guitar is a lot sharper, so you could interpret this as added realism and an encouragement to hold the guitar correctly. Until you make the jump to a game like Disney Star Guitarist, which uses a real guitar as a controller, you're not going to encounter a nicer controller for games like Rock Band and Guitar Hero than this. The issue is the price. At US$199 (AUD$399.95/GBP£149), you'll be spending more than enough to get yourself a real beginner's guitar and practice amplifier - but if you've decided you don't want to do that (or already have) and have the cash to burn to make your music gaming experience as good as it's likely to get, then you won't go wrong with Logitech's offering. The existing model will work with a PlayStation 2 or PlayStation 3, and Logitech is currently working on an Xbox 360 version.